1. Type of operation: Opend feedlot and confined operations. 2. Type of animals: Daily manure production and type of waste storage. 3. Crop selection and nutrient needs. Most of the above factors pertain to the livestock/farm operation and not the system itself. Debris Basin and Holding Pond: A debris basin is a shallow slightly sloped channel and a holding pond is an excavated or embanked pit. Runoff comprised of liquids and solids float into a debris basin, where solids settle out and the liquids are drained into a holding pond. The liquids are conveyed by means of a riser in the debris basin draining into a pipe or open channel leading to the holding pond. This system allows the solid wastes to be separated from the liquid wastes. Single Retention Structure: A single retention structure is usually constructed for an open lot where topography of other local characteristics such as a high water table prohibit the use of a debris basin and holding pond. Minimum storage is maintained by pumping the pond periodically because both liquids and solids are collected together. Basically standard center pivot irrigation system with impact sprinklers. 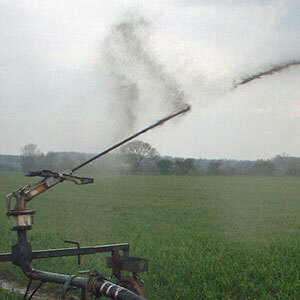 Minor modifications such as larger nozzles, strainers, etc. Holding tanks and pits: Holding tanks and pits are storage facilities which hold animal waste until weather and field conditions allow for proper disposal. This type of waste control facility is used where semi- or totally-housed feeding of livestock is practiced. Oxidation ditch: The oxidation ditch is a form of mechanical aeration where air is injected into the waste water by means of mechanical or diffused aeration equipment. It is used in confined housing operations where animals are on slatted floors and the wastes are deposited directly into the oxidation ditch below. Any overflow must discharge into a lagoon or outside storage tank. Anaerobin lagoon: In an anaerobic lagoon descomposition of the waste is accomplished by bacterial action in the absence of oxygen and if the system is managed properly, pumping should not be required. The anaerobic lagoon normally uses less surface area and is deeper than the aerobic lagoon. Aerobic lagoon: Aerobic lagoons depend upon bacterial utilizing oxygen for waste descomposition. When properly designed and managed, aerobic lagoons are relatively odor free but require greater surface area per animanl than the anaerobic lagoon. Pumping would normally not be required. Lagoons are used primarily for semi- and totally-housed swine operations. Number of setting basins or lagoons. Pumping point in reference to slurry entry into holding structure. Amount of additional water added by excess livestock watering, building or area runoff, building clean up or flush water. Planned management of the solids. Pump station designed for strainer to eliminate pickup of excessive sized particles when compared to nozzle opening and screen cleaning. (Weeds and other debris are often blown into lagoon). Planned maintenance on systems for possible plugged sprinklers.